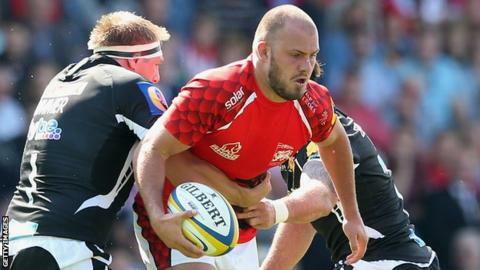 Leicester Tigers have signed back-rower Lachlan McCaffrey from London Welsh. The Sydney-born 25-year-old made 14 Premiership appearances for relegated Welsh this season, having signed from Brumbies in July 2014. McCaffrey has previously had spells with Brumbies' Super Rugby rivals Waratahs and Western Force. "He is an athletic, ball-playing back-rower with the ability to play in a few positions," director of rugby Richard Cotterill told the club website. "He's had some experience of the English club game this season and we think there is more to come from him in this environment." Meanwhile, the club has also announced that versatile back Niall Morris and lock Sebastian de Chaves have signed new contracts with the club. Morris, 26, has made 68 appearances for the Tigers since signing from Irish club Leinster in 2011. South-Africa-born de Chaves, 24, has played 33 times for Leicester having joined the club from Mont-de-Marsan in 2013.